Sometimes, the most productive thing you can do is relax! 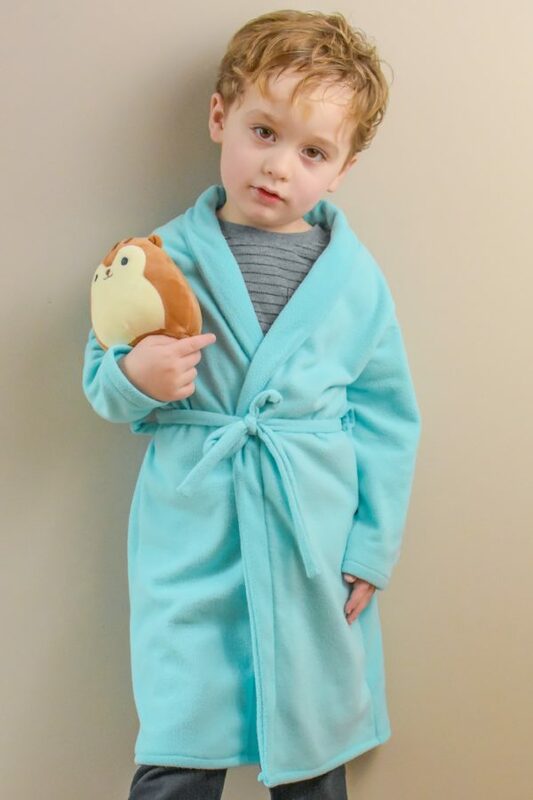 And this childrens bathrobe sewing pattern is exactly what you need for some chilled-out down time. Relaxing on the couch in front of the telly, snuggled up in a cosy dressing gown is why Saturday mornings were invented. Spend your summers chilling out next to a swimming pool or on the beach in a cossie cover up. Easing into the day with a bathrobe draped around you like a warm hug, makes school and chores much more fun. 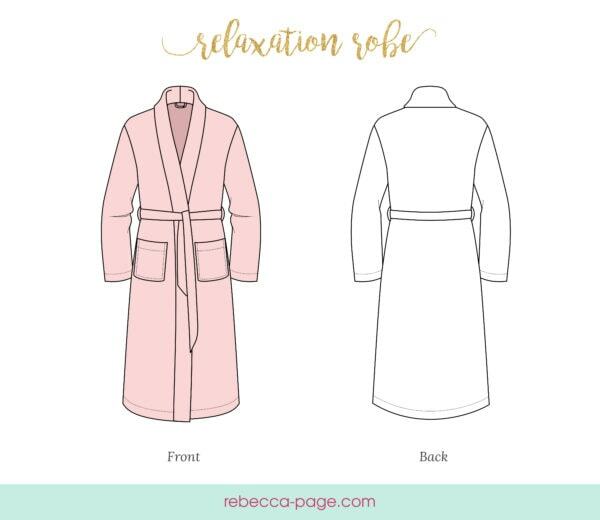 Whichever way you plan to use the Relaxation Robe, complete comfort is yours with this pattern. Options – Optional patch pockets and hanging loop. This pattern came together so quickly. I haven’t seen on front pockets in a long time, but the instructions were easy to follow. My son loves it! He put it on as soon as I finished it and wears it every chance he gets. I’ll definitely use this pattern again. This was a fun and easy project for my little one, so comfy. I believe this relaxation robe will get a lot of use. Great pattern drafting and great instructions. I love that the collar on this pattern is in two pieces, it makes the finish so nice! I was able to complete two of these matching robes in an evening and my boys are super happy with them. As always another wonderful pattern. My 5 and 8 year old even helped sew their own robes! Love how easy the patterns are to put together and look professional. Love this quick sew. Now just to make more for all the requests I am getting. Perfect for all seasons with multiple fabric options and super comfy to boot. I love the fact that this pattern can be used on both Knit and Woven Fabrics. Clear instruction and such a quick sew. The attachment of the belt loop tested my pentience, as the those couple of centimeter where too thick. The elastic in the back keeps twisting every time she put it on/off and therefore prefer to top stitch over it in order to keep in place. Thank you for such an amazing pattern! Was pleasantly surprised at how quick this sew was. A robe pattern has been on my want list for a while and these turned out perfect. I love this pattern. It’s such a quick sew and i think everyone in your household needs one. You can work with color block or just make a classic robe. Instructions are very clear and good to follow. It’s a good and interesting pattern for beginner to start with. It is simple and enjoy things to sew. I love part when you connect the collar to bodice. Thank you. Such an easy pattern!! I did it in satin for a group of bridal party robes, which did as a little complexity to the pattern, but they look amazing and every one loves them! 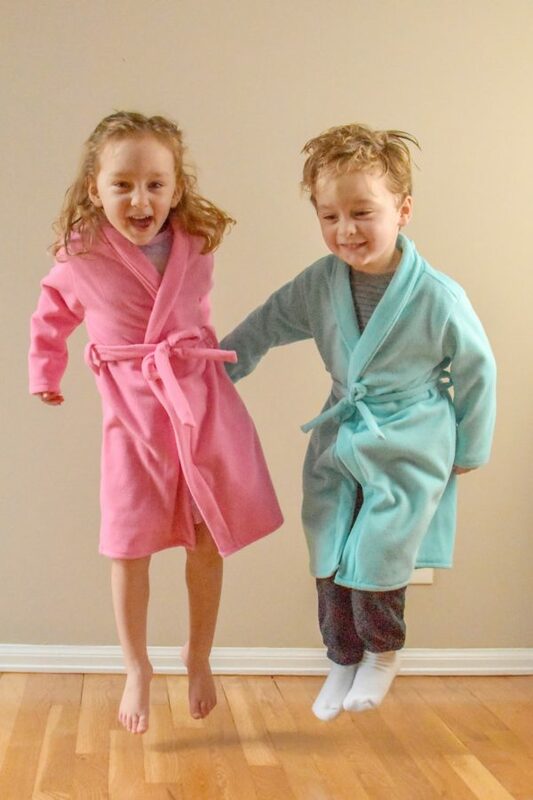 This was such an easy pattern for a cute robe that my son loves! I made it in fleece so it’s nice and cozy!